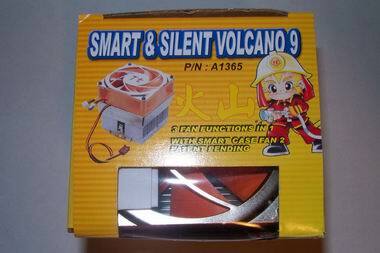 The Volcano 9 originally came to market by itself named the Smart & Silent Volcano 9. It came attached with a Smart and Silent fan, which has three control settings. 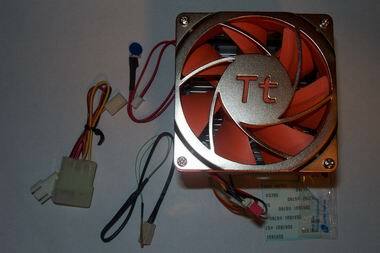 Afterwards, the S&S fan had a small facelift which resulted in the introduction of the Volcano 9 Coolmod. 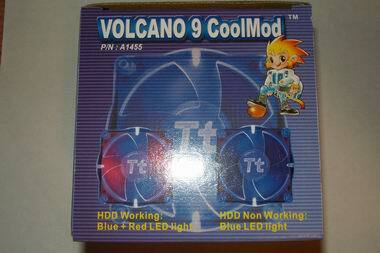 The CoolMod basically is referring to the LED enhanced S&S fan that's now attached to the Volcano 9. Confused yet? The V9 box comes with the heatsink, temperature probe, rheostat speed control dial, 3pin -> 4pin adapter, thermal grease, thermal pad and a sheet of instructions. The S&S fan allows you to control the speed 3 different ways. So instead of a screaming 4800RPM fan blasting all day and night, you can finally control the amount of performance you need. Let it auto adjust itself through temperature changes using the probe or run it non-stop if you need the cooling. Better yet, slap on the adjustable dial and tweak to your hearts content. Let's see how this is done. The main control points to note is right here next to the fan. In the current position above, you are making the fan spin at full speed. 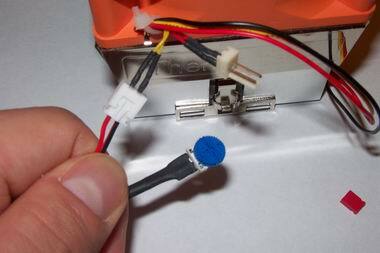 If you need to use the temperature probe, disconnect the jumper on the right connector and attach the probe there. Position that probe on your CPU and you'll have a fan that auto adjusts for you instantly. If you prefer to tweak it yourself, remove the jumper and put the rheostat dial attachment on the left connector. 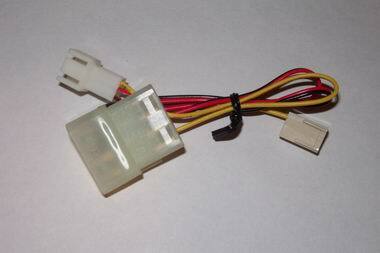 The only time that jumper should be there on the right connector is during full speed operation. 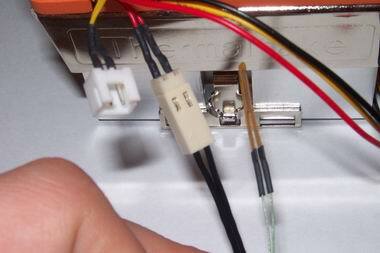 A 3->4pin adapter is included in case you wish to use the power directly from your power supply. 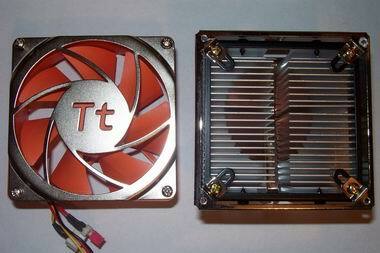 Does the heatsink look familar? 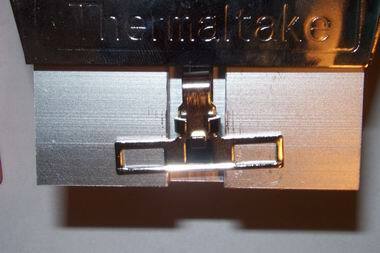 It should, it's the same heatsink that ThermalTake uses in their Volcano 7 model. The only difference is that it isn't blue. The retention clip is different as this one uses a 3 point connection. 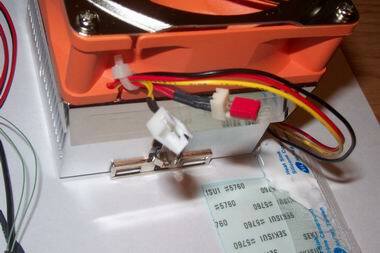 This tends to be more secure method of keeping a large heatsink in place. Like the previous V7 model, this heatsink uses the same copper middle base. 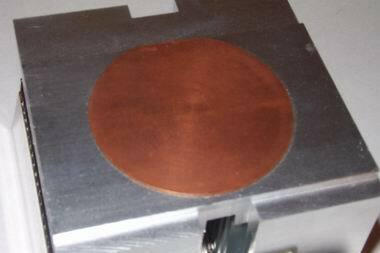 Copper is more efficient in retaining heat than aluminum, but it takes longer to dissipate it. With a combination of copper and aluminum, TT is trying to bridge a gap in terms of speed of intake and release of heat.